The Scottish engineers who grounded brutal dictator General Augusto Pinochet’s air force by boycotting vital repairs on the engines of Chilean fighter jets are to be commended in the Scottish Parliament tomorrow, to mark the 45th anniversary of the military coup. The men who worked in the Rolls-Royce factory in East Kilbride, South Lanarkshire, starred in the award-winning documentary “Nae Pasaran!” which received its world premiere at the Glasgow Film Festival in March. They will be joined by Edinburgh-based film maker Felipe Bustos Sierra whose father was a Chilean journalist in exile and who tracked down the former workers after hearing fellow Chileans talk about the men. A motion raised by Linda Fabiani, SNP MSP for East Kilbride, has cross-party supporting allowing a debate tomorrow will commend the men’s action. The film will have special previews in cinemas across the UK this month including Edinburgh, Glasgow, Dundee and Aberdeen to coincide with the 45th anniversary of the coup, before going on general release on 2 November. Describing how the decision was made in March 1974, Mr Barrie said: “I was approached by another AEUW shop steward, Bob Fulton, who said ‘Stuart, there’s Chilean engines in here’. Our union had condemned the Chilean junta’s overthrow of the government and the torturing and killing of civilians and those who opposed it. So I said to Bob, ‘right, let’s black the f******’. Bob also said he was a Christian and didn’t want to work on them. I was 29 then, a bit of firebrand, I did things like that if I thought it was correct. We were all a wee bit proud of the way it worked out. 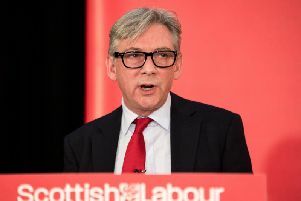 Mr Barrie added he and his colleagues were later listed on the economic league “blacklist”, creating difficulties in getting employment with other employers in the future. Mr Bustos Sierra said it was a “lovely surprise” to be invited to the Scottish Parliament.